I get so emotional: Groundbreaking study reveals that emotion is a primary force behind women's cosmetics purchases. In other news, hunger is a primary force behind the consumption of food, and cold weather is related to purchases of mittens. Libertarian pedicures: Using a $4 pedicure in the pseudo-libertarian Philippines as a hook, a Blogcritics writer asks whether libertarian economies can actually succeed. Certainly beauty services thrive in places with lots of poor people who can pay attention to rich people's toes, so hey, why not? What a croc: Attention animal rights folks: Why dwell on "turkey genocide day" when you can instead wonder why anyone thought giving a crocodile a pedicure and "bikini wax" was a good idea? "Prey on me": Haunting prose poem on the unreal power of pretty, from Christa Forster: "Look to your left. Look to your right. Now look to your left again, and notice the prettiest girl in the room. / (You’ve been discovered.) / What happened to me happened to her, or will happen to her, and also happened to the other ones around her. The differences emerge in the degree, in the number, in the stars that are shining for us." Finally can check off my gentleman friend from my gift list. Drugstore Santa: Mass market brands are ramping up their "gift sets" for holiday shoppers. 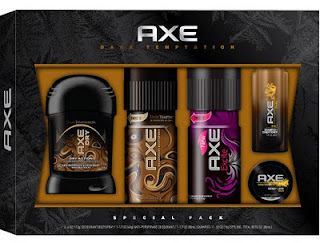 Because who doesn't want a box of deodorant with matching cologne under the tree? Farewell, Evelyn: This Economist obituary for Evelyn Lauder, Estee Lauder senior executive and daughter-in-law to Estee herself, who died November 12, is the only one I've read that reads like more than a laundry list of her pink-ribbon accomplishments. Indexed: Measly attempt to replace the term "lipstick index" with "face and fat index," thus thoroughly missing the point that though the literal veracity of the lipstick index has been disproven (lipstick sales did not increase in this recession), the larger truth of it sticks with us. In tough times, we want the affordable luxuries. What exactly those are might change (right now it's nail polish), but the principle remains. Startup kiosks: Startup cosmetics companies are flirting with kiosks as a route to establishment instead of actual stores. This piece is about the emergence of cosmetics kiosks in Dubai, but the idea is thriving in Eastern Europe as well. Less you: Whole-grain Cheerios wins the worst tagline award for their weight-loss-centric marketing push linking consumption of whole grains to successful weight loss: "More grains. Less you." Kosovar beauty: Stunning wedding makeup from Kosovo, via BellaSugar. Social justice, lightness, and origin: I don't think Nahida had body image in mind when writing this beautiful post about the jihad between our own internal lightness and darkness, but in reading this I came a little closer to understanding the duality of shame and pride we feel about our appearance. "But to be worthy of being a human being, of whom the best are said to surpass the status angels...is not to become entirely of spirit, or become angelic, or to condemn the human body which God has created for us—but it is to constantly struggle in our duality, as souls borne from the joining of our spirit and body, and give precedence to attributes that are closer to God." Living outside the beauty myth: Virginia identifies a crucial factor in the idea that black women have a healthier body image than white women: If you're outside of the dominant image of what "beauty" is, you may have more freedom to determine beauty on your own terms. This matches what Rosie Molinary wrote about in Hijas Americanas: When she was researching the book, she expected that the young Latinas she was interviewing would have a more positive self-image because of the growing number of Latina role models in the media compared to when she was young. She found the opposite: "Instead, they talked about how it created a really hard standard for them." Glamour gals: Interesting interview with Electra Lang designers at Deep Glamour: "For a woman, glamour is a necessity." I think if you look at makeup more for it's quality and what it can do, the less emotional it is. When I look at an eyeshadow, I examine the pigmentation and how it performs compared to others. I don't really think, "Wow this is going to make me look great!" I think people should start looking at it as an artist would paint or brushes rather than love and hope. Utterly agreed, Courtney--the question is, how can we truly divorce the two? I mean, even when I get a cheapo product because I just need something to make my eyelashes darker or whatever, I wind up feeling chuffed that I've gotten away with something. It's like I can't escape! The important in which print can easily glow over and above this kind of. Since constantly these kinds of hublot replica are believed to be important wintertime basics, in addition to making it possible for print. Together with incorporating your own personal components and even blending upwards a couple of hublot replica uk types and also shades this kind of wintertime will surely established oneself separate kind all others. Nowadays once we notice the definition of made by hand replica prada handbags what exactly is given brain could be the beaded form of timepieces which can be crafted from semi-precious fake dior handbags a by means of gap which is strung about wire. Despite the fact that preserving updated together with existing styles is very important for anyone trying to become since elegant as you can. They will help make gorgeous replica gucci handbags, bracelet and also bracelets.